The CR308 is an easy to use sound level meter that meets the international standards to Class 2 / Type 2, as required by many noise measurement standards. It measures the Fast or Slow sound level with both "A" and "C" frequency weightings. It is essential that a sound level meter meets these standards if it is to be used for any important measurements, particularly those that involve any other legal purposes. The CR308 meets the strict demands of IEC 61672, IEC 60651 and ANSI S1.4 and is provided with a Calibration Certificate at no extra cost, so you can make your noise measurements with confidence. The CR308 measures the instantaneous sound level with either A or C weighting. Most noise regulations require A weighting. It also has both Fast and Slow time response. Many regulations require Fast but some, like the USA OSHA regulations use Slow as it is easier to average by eye. The meter also provides the Maximum and Minimum readings for whichever weightings are selected. A Reset button is used to clear and start the next min/max measurement. An AC output and optional DC output mean this meter can be connected to a level recorder, PC equipped with an A/D converter or integrated with another data logging system. See Specifications tab for more details about the standards and noise measurement range. The CR308 is a simple hand-held sound level meter with no data logging and no additional software. As many applications require a single reading to be made, it is often easier to note it down manually than to connect to a computer and download it. This meter is ideal for making quick sound level checks of machinery noise, office noise and other issues around the workplace. However, please read the following notes about the noise at work regulations. The standards for fire alarm testing usually demand the measurement of the "A" weighted "Fast" sound level. 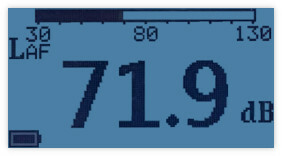 The CR308 sound level meter provides this measurement. Although not a data logging meter, the CR308 has an AC output and a DC output, making it ideal for connection to a data logging system via a suitable A/D converter. For regulations based on the US OSHA standard for occupational noise, this meter is adequate for a basic survey. It provides the noise parameters that are needed: Slow, 'A' weighted sound level and Peak readings. The European noise at work regulations and guidelines state that you should use a Class 2 Integrating Sound Level Meter. While the CR308 is a Class 2 meter (so it is accurate enough), it is not an Integrating meter, so it does not provide the average sound level or LAeq as required. For a full noise at work survey to EU style regulations we recommend the use of the CR162A Integrating Sound Level Meter or CR162B Logging, Integrating Sound Level Meter. The CR308 sound level meter starts measuring noise levels as soon as it is switched on. The most common measurement is Fast, A weighted sound level, abbreviated to LAF, so this is the default reading. The bar at the top of the display shows the current sound level and how it fits within the range of the meter. This is most useful when viewing parameters such as Max or Min. If the regulations require regular calibration checks then you also need the CR514 Calibrator, which is included in the CK308 Noise Measurement Kit. To check the meter's calibration you put the calibrator over the microphone, switch it on and press the Cal button. The meter makes any adjustments automatically. The CR308 sound level meter can be bought on its own, with a calibrator or as part of a Noise Measurement Kit (meter, calibrator, case). Please check your regulations to see whether you need a Calibrator, or contact us for advice before ordering. Our noise measurement kits are designed to include all the parts needed, enclosed in a carrying case. 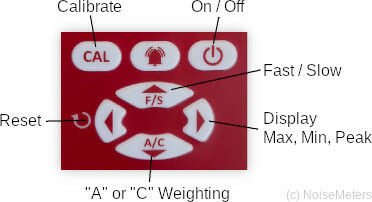 For more information about the calibrator, please visit the CR514 Sound Level Calibrator page.